Travel culture is becoming more and more prominent as people realize the value of rest and relaxation in between their hectic lives. Smart businesses recognize this phenomenon and have started leveraging the growing travel culture to their benefit. Seeing how it is a lot easier to encourage consumers to travel, businesses are also quick to connect the dots of this demand for travel to the need for products that support it. New brands specialising in travel products and accessories have started to emerge in the last 5 years. But how do businesses—including those that have very little to nothing to do with travel—use this to their advantage. The answer is creative marketing. By producing personalised travel mugs, key rings, bags, etc., you can tap into the gold mine of the industry, using these travel products as vehicles for your marketing messages. Travel mugs are about the smartest items to personalise for when you want to target avid travellers, but they are also very effective for your average consumer. Stand on any corner in a business district and you will likely find people cradling custom travel mugs containing their daily caffeine fix or whatever their favourite work hour potion may be. Like typical promotional products, travel mugs can hold most any type of marketing message, ranging from snazzy slogans to brand logos as well as the most other interesting visuals that will definitely catch people’s attention and stay in their minds for long. 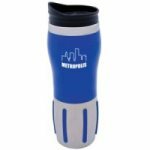 Using everyday items like travel mugs for promotion is a wise marketing strategy as it allows your promotional message to be in the hands of your target clients if not 24 by 7, at least for a large portion of their day. This is one of the greatest keys to effective business promotion.